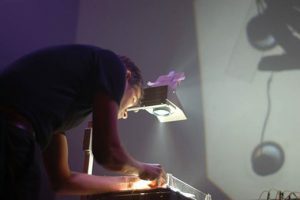 I combine this instrument with a modified overhead projector, the ZoOHPraxiscope, to produce cinematographic visuals based on the principle of the Phenakistiscope. The set starts with two motors that are placed on the OHP, each motor carries a an acrylic rectangle, the rectangles are spinning. 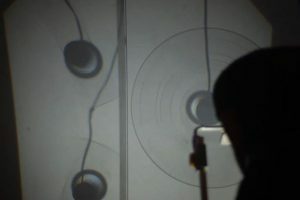 The two rotating shapes are projected as translucent shadow objects onto the wall. A vertical line is pushed towards the rotating shapes, on contact, the shapes reverse direction till the other side hits the line again. A beat is created through the interaction of the shapes with the vertical line. A third motor carrying a disc with engraved shapes is mounted, the motor starts to spin, in synchrony with the oscillating shapes, every eighth beat, the motor makes a rotation, the engraved shapes start to spin. Adding more more motor events, the disc goes faster and faster, the shapes smear out can’t be resolved by the eye anymore. Then flicker is tuned in, first at high frequency, barely perceivable softly going down. With the introduction of flicker, the shapes become visible again but now they are dancing, rotating back and forth. This constitutes the first part of the set, as sound only the motor sounds and a piezo-pickup are used as raw material and then filtered with a band-pass filter. picture discs with cut-out shapes are used. the vertical line, which also produces a deeper sound.